Alex Perriello CEO of Realogy Franchise Group shares insights into what he has found works for small business owners who are looking to have new customers seek them out along with their products and services instead of the other way around. Perriello has found small business owners who consistently blog generate a higher level of rapport with interested prospects which in turn can lead to increased customer counts and satisfaction. Because regularly publishing your business thoughts to a blog both prequalifies and pre-sells your target audience (readers). Ironically, Perriello’s message may still not be heard by the millions of small business owners who most would likely benefit from hearing his advice – those small business owners who still don’t blog let alone market online. When I launched my first website back in 1999 – blogs didn’t exist. To get my site MarketingPrincples.com launched, I had to use ad agency designers who knew how to write code which in turn published my content on the nascent world wide web. After my site launched, I realized I needed to make some content changes. Because blogging platforms didn’t exist and I hadn’t bought the code they had used to develop my site, the designers initially charged me $100 for each change I wanted to make to my site. I quickly set out to find my own web developers who could build my own content management system. While giving a presentation at a local university’s engineering college, some young guys came up and said they would be interested in working with me. I agreed to give them a shot. They built me a content management system in .ASP where I could upload and control my own content without any ongoing costs. Off to the races I went. Little did I know at that time nor did it occur to me that the idea of a back end content management system would be something other businesses would want. Nor did I foresee that content management would ultimately become known in general as blogs and blogging. If I had, I guess I would be on the other side of this post founding and running WordPress.com not my consulting practice. Anyway in the early days of the internet, the content platform providers all suggested bloggers just sit down and blog every day for a year to generate their own unique set of pages and content. Well – 10 years later I have done it. I have blogged here every single day for the last 365 days over a period of exactly one year beginning on September 1, 2008. I have learned a lot and will write more about what the experience has taught me – tomorrow. 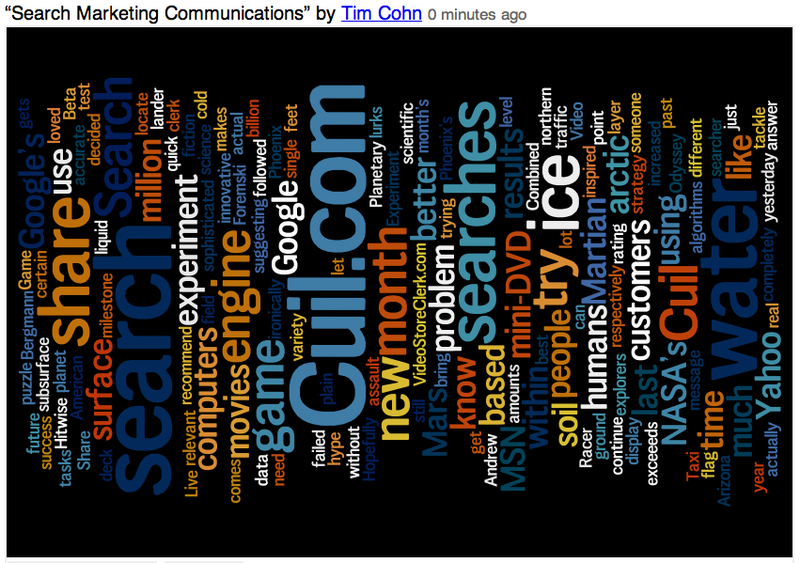 Too bad Wordle.net isn’t at Wordle.com. 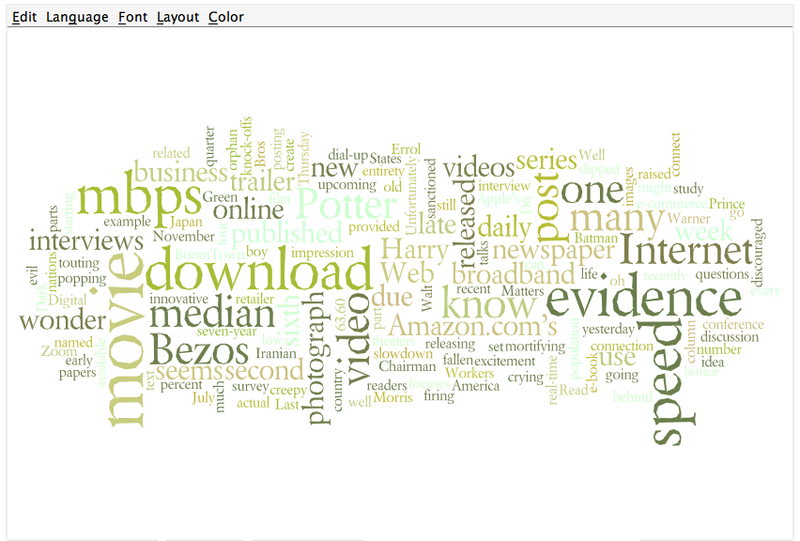 I would guess Wordle.com will soon be enjoying an increase in their type in traffic. I don’t know what to make of Wordle’s take on this site cohn:wordpress.com. All of the lines run vertical. So far I haven’t seen another image rendered all of it lines vertical. Every other site produces both vertical and horizontal word patterns like those found in the All Things Digital screen shot below. I wonder if any sites will render all horizontal text patterns? 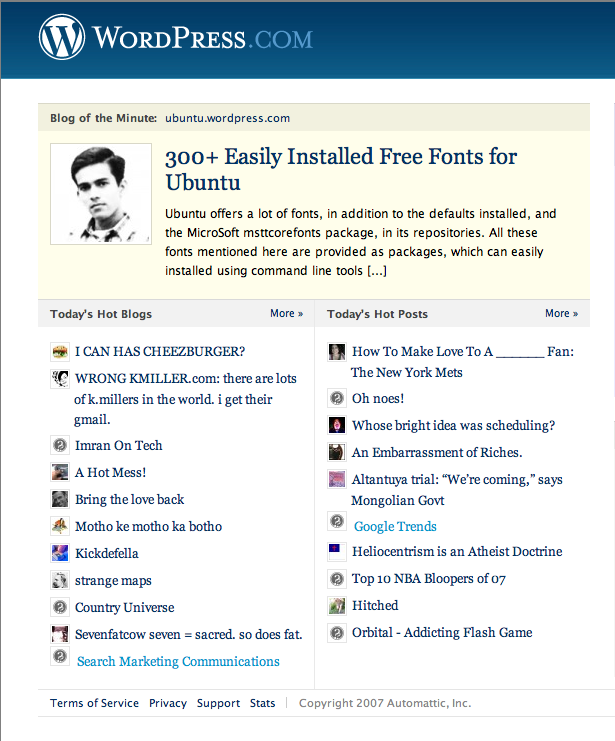 A single article on Google Trends single-handedly lifted this blog to both the Hot Blogs and Hot Posts columns on the WordPress.com home page today May 23, 2007. 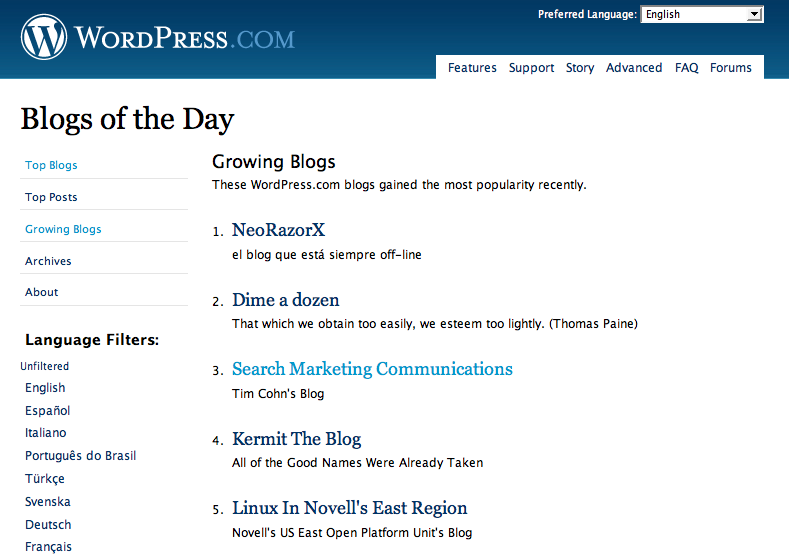 My Search Marketing Communications blog made the fastest growing blogs list today at WordPress.com. I started this blog to see how much traffic I could generate armed with just a few articles and my knowledge of the search audience. I have posted 24 articles since September 04, 2006. This blog has now attracted over 10,000 visitors. Even though I haven’t considered myself a blogger, it appears my blog has now safely exceeded Mr. Schmidt’s criteria for being average. Welcome to the Tim Cohn blog. This is my third attempt at blogging. My first two forays were still early in the adoption cycle and prior to my getting a contract to write a book for John Wiley and Sons. I read recently in Strategy+Business that the consultants at Booz Allen Hamilton didn’t think the blogging phenomenon would continue. Although, I can see their point – blogging is an uphill model ie., it requires time and effort, I think the social benefits of blogging will exceed its costs otherwise.